**New updated pics of Tuxie below! Check out Tuxie's adorable new sleepy time video below! He looks cute and yawns! His new tricks video is up, see it below! He does come, sit, shake, high five, wave, down, and roll over! Here is an adorable video of Tuxie looking cute and yawning! His sleepy time video! Here is Tuxie's new tricks video! He does come, sit, shake, high five, wave, down, and roll over! New pics of Tuxie! He is a gorgeous cuddle bear! Baby Tuxie - so cute! Tuxie is a cute and charming black tri boy! If you loved our black tris from last year, then he is the one for you! He is just like Bailey and Rocky and is going to be an extremely good looking dog just like them! He has a stocky body with great structure, great show coat, and a perfect blocky head with an adorable expression! He is always looking at me with that cute expression! He is a very sophisticated boy, all dressed up in his fancy and flashy tuxedo! He is sweet, gentle, smart, willing, obedient, calm, cuddly, and beautiful. He is very smart and willing to learn anything quickly. He has the best personality! His favorite thing to do is cuddle in your lap! If you sit down on the floor, Tuxie will be in your lap cuddling right away! I call him my cuddle bear! He is just a sweetheart! He loves to play fetch and always brings the toys back into my lap! It is so cute! If you have ever wanted a dog that loves to cuddle and be by you always, go everywhere with you, then he is the one! He would love to be someone's best friend and cuddle up in bed or on the couch! He is a laid back, lovable, and adorable puppy! He did great on his obedience training and loves to please! He knows come, sit, shake, high five, wave, down, and roll over! Wow! He is potty trained, crate trained, and leash trained! We did all the hard work for you so you can just take him home and love him! He has been raised inside our home and is ready to go home with you now! 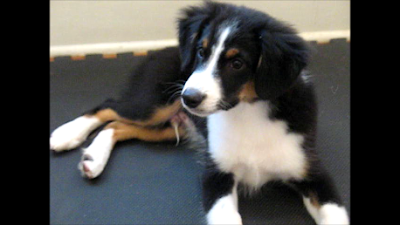 See his adorable videos below of him showing off his training! New video and pics coming soon! If you are interested in adopting Tuxie, please download and fill out the All-Star Mini Aussies Puppy Adoption Application below and email it to AllStarAussies@gmail.com.